Preheat the oven to 350 degrees and put a baking sheet on the middle shelf to heat. Halve the plums and remove the pits. Cut the halves into quarters if they are very large. Toss them with the sugar and tip them into the prepared baking dish. (For a special treat, toss the uncooked plums in a little sloe gin). To make the crumble topping, use your fingertips to rub the butter into the flour with the salt until it resembles coarse bread crumbs. Alternatively do this in a food processor. Stir in the sugar. Lightly scatter the crumble topping over the plums. Place the baking dish on the hot baking sheet and bake in the preheated oven for 40-50 minutes, until golden brown. Remove from the oven and serve warm with cream. Serves 4-6. Good morning, Roy Kelley I have a loss for words.... read my mind....it's an easy read!!! Oh yes, yes, yes, Roy. I adore baked good with plums. (Must be the German in me.) Saved for future use. Looks delicious, Roy. I wonder if I could sweet talk the chef of the home to whip one of these up. Good morning Roy. I know Barbara Todaro won't eat it so I will volunteer to eat her portion! Enjoy your day! Good morning Roy - the picture looks very tasty. Thanks for sharing a local Maryland recipe. Hello Roy, I almost made a sour cherry crumb pie last night for dinner guest but ran our of time. Doesn't this look delicious? This is the time of year for cobblers, crumbles, and pies, oh my! We will also give this a whirl and serve it warm with vanilla ice cream. Yummy. Roy- I took one look at that and I want some right now!!! It looks yummy. The receipe and photo look fabulous. Should be easy to cut out some of the butter and make it a bit healthier. Thanks! 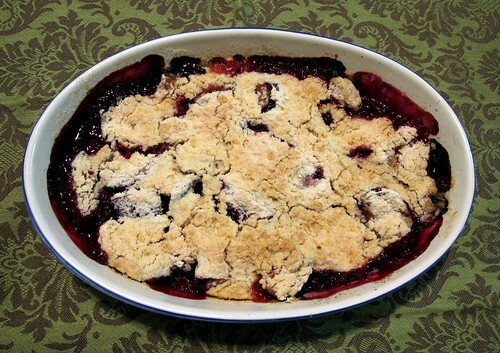 Hello Roy Kelley thanks for the delicious Maryland Plum Crumble recipe.